This is a 275 Gallon IBC tote that we bought locally that previously stored honey. The tote comes in a steel frame to support the liquid pressure in the plastic tank. The tank is already plumbed on the bottom with a shutoff valve and 2" drain line attachment. I'm cutting 12" off the top section which will be flipped over to make a media filled grow bed. The remaining 175 gallon tank will house the fish. The schematic drawing below provides the system configuration and water flow. 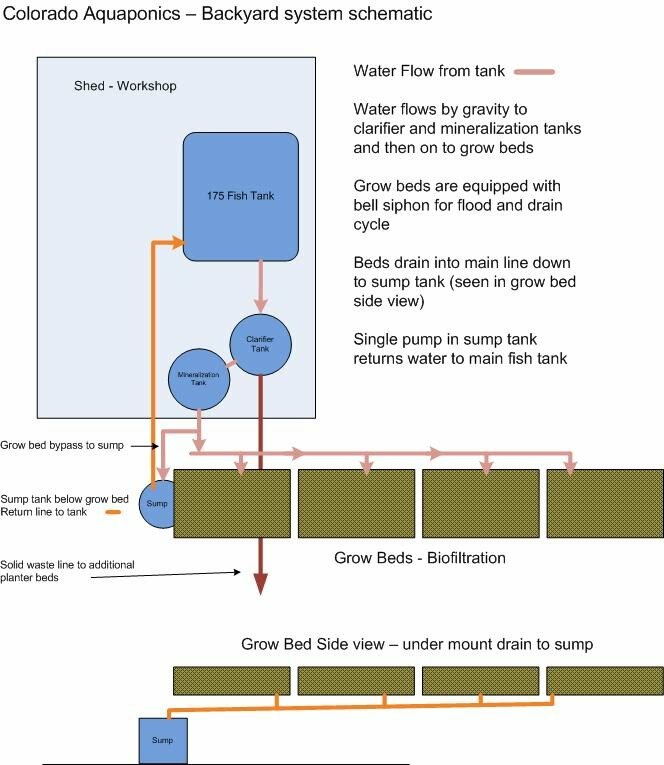 We are expanding on the traditional flood and drain design by experimenting with additional filtration tanks normally found in raft aquaponics to help remove solids prior to water entering the grow beds. The addition of the clarifier tank will also allow us to drain nutrient rich solid fish waste and pipe it directly to other planter beds on the ground or to our worm bin. When the greenhouse is complete we will incorporate a raft tank into this system as phase two of this project.